Just a few days past of over a century ago, a massive tragedy of disastrous proportions hit New York City and its garment district. 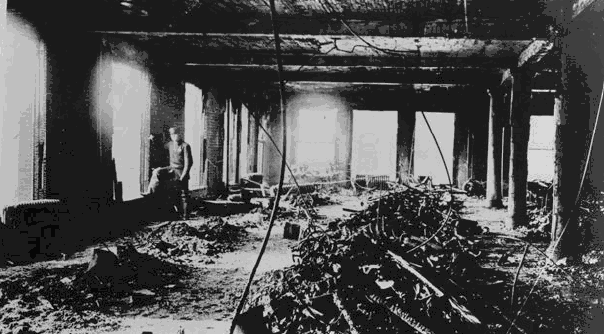 One of the most killing fires burned out the Triangle Shirtwaist Factory. So why bring it up now? Because we have a new bunch of bastardly bad asses who think Unions are destroying the world they love to live in – the world of slave labor and billionaires Let’s bring this story up again just so we understand the ilk who are now advocating new laws designed to deter labor unions and working people in general. Did we really want to put into office all those Repugs and Tea Party morons who will put America back to the 19th century? Somehow I would like to think that we were carried away in our efforts to wake up the Washington war lords. Well, whatever, here is the story as I researched it. And, yes, it is Pro Union, just like me. On Saturday, March 25, 1911, minutes before more than 600 workers were to leave for the evening, a small fire began on the eighth floor of the Triangle factory. The flames reached bundles of material that hung from the tall workroom ceilings and then swept along a carpet of highly combustible lawn scraps that had accumulated on the wooden floor for two months. Flames quickly spread through open windows to the top two floors, and within minutes the fire consumed the entire loft factory. The Sarbanes-Oxley Act of 2002, variously known, as it swept through Congress, as the Public Company Accounting Reform and Investor Protection Act of 2002, Corporate and Auditing Accountability, Responsibility, and Transparency Act of 2002, Corporate Responsibility Act, the Corporate Fraud and Accountability Act, Justice for Victims of Corporate Fraud Act, the Corporate and Criminal Fraud Accountability Act, the Public Company Accountability Act, and just generally as "What on earth were you people thinking when you decided to engage in this kind of financial reporting and analysis? Act." Sarbanes-Oxley marks the third great regulatory reform for publicly held companies. First, there were the new laws and reforms on insider trading and junk bonds following the Ivan Boesky and Michael Milken debacles. Then there were the reforms that came about as a result of the collapse of savings and loans. "Never again," those responsible for these reforms and legislation muttered. With new requirements, new sanctions, new penalties, new public disgrace, no one would ever be so bold as to perpetrate schemes and artifices on the market ever again. Yet, here we are again. And we are tackling the same sort of task: How do we prevent corporations from trotting down these temporarily lucrative paths of fraud? What types of checks and balances could we create that would prevent such frauds? The Triangle Shirtwaist fire was the deadliest workplace accident in New York City’s history. After the fire, the women workers’ stories inspired hundreds of activists across the state and the nation to push for fundamental reforms. For some, such as Frances Perkins, who stood helpless watching the factory burn, the tragedy inspired a lifetime of advocacy for workers’ rights. She later became secretary of labor under President Franklin Roosevelt. March 25th marked the 100th anniversary of the Triangle Shirtwaist Factory fire, New York's landmark industrial disaster that killed 146 of the factory's employees — most of them young immigrant women and girls of Italian and European Jewish descent. The tragedy sparked nationwide debate on workers' rights, representation and safety. An officer stands at the Asch Building's 9th floor window after the Triangle fire. Sewing machine wreckage of the Triangle factory fire are piled in the center of the blaze damaged area. 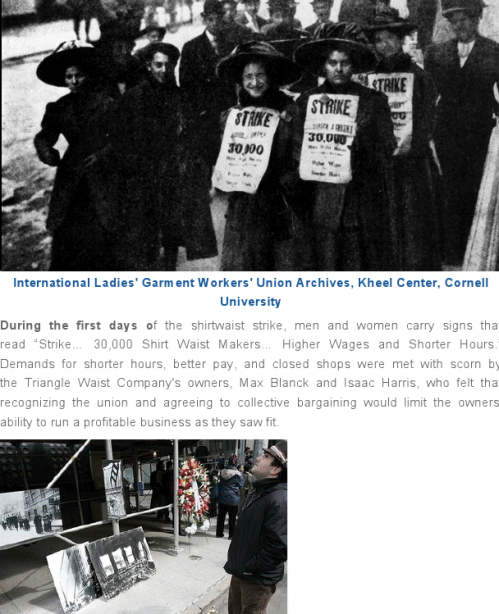 Working people around the country are commemorating the 100th anniversary of the tragic Triangle Shirtwaist fire, which killed 146 workers, mostly young immigrant women, many of whom jumped to their deaths from the 10-story factory to escape the fire because they were locked inside. 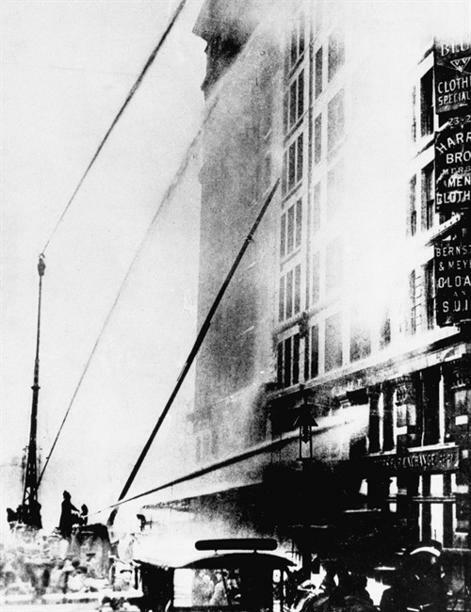 FILE - In this March 25, 1911 file photo, firefighters work to put out the fire. NEW YORK, N.Y. - It was a warm spring Saturday when dozens of immigrant girls and women leapt to their deaths — some with their clothes on fire, some holding hands — as horrified onlookers watched the Triangle Shirtwaist factory burn. To mark the centennial, hundreds of theatrical performances, museum exhibits, lectures, poetry readings, rallies and panel discussions are taking place nationwide. Two documentaries have aired on TV; PBS' "Triangle Fire" premiered Feb. 28 and HBO's "Triangle: Remembering the Fire" on Monday. Descendants of victims and survivors of the fire will gather Friday for a procession to the site in Manhattan's Greenwich Village. The building now houses New York University classrooms and labs. Suzanne Pred Bass, a Manhattan psychotherapist and theatre producer, is the great-niece of Katie Weiner, who survived the Triangle fire, and of Rose Weiner, who did not. Bass ticked off the reasons why people remain fascinated by the Triangle fire after 100 years. "It's the youth of these women," she said. "It's the tragedy, it's the changes it spawned and it's the immigrant experience." "They were panic-stricken," said Eileen Nevitt, whose grandmother Annie Sprinsock survived. "It was hellacious, and they ran for their lives the best they could." Firefighters rushed to the scene and raised their ladders, which reached only to the sixth floor. The fire was under control in 18 minutes — too late. At the trial later that year of Triangle owners Max Blanck and Isaac Harris on manslaughter charges, survivors testified that their escape had been blocked by a locked door on the ninth floor. Some said the door was kept locked to prevent theft. Katie Weiner said she felt for the door, which she could not see in the smoke, and turned the knob. "I pushed it toward myself and I couldn't open it and then I pushed it inward and it wouldn't go and I then cried out, 'The door is locked!'" she testified. Meanwhile, the elevator shuttled up and down carrying as many workers as could cram into it. Weiner joined the crush for the last elevator but was pushed back. She testified that she grabbed the elevator cable and threw herself in, landing on girls' heads. She was the last person out of the burning building. The jury heard from 155 witnesses before returning a verdict of not guilty. "I believed that the door was locked at the time of the fire," one juror said. "But we couldn't find them guilty unless we believed they knew the door was locked." Workers' advocates continued to blame Blanck and Harris, who had resisted a union drive in 1909. "It's really important for them, I think, to have a villain," she said. Blanck and Harris were on the 10th floor when the fire started and were able to escape to the roof. But several of Susan Harris' relatives died in the fire, including Jacob, Essie and Morris Bernstein, members of Blanck's wife's family who worked at Triangle. Harris lives in Los Angeles but is spending March in New York to take part in Triangle commemorations. An artwork she created to honour the fire victims — made of antique shirtwaists and handkerchiefs — will be displayed at the New York City Fire Museum for a month. One witness to the Triangle workers' death plunges was Frances Perkins, who later became the first female Cabinet member when President Franklin Roosevelt appointed her secretary of labour. Perkins was having tea nearby and heard the commotion. She ran to the scene as the first body hit the ground. "That fire is the event that changed her life and that really changed the course of American history," said Kirsten Downey, author of a book about Perkins, "The Woman behind the New Deal." 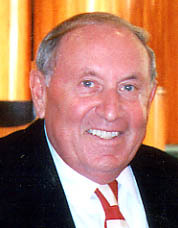 Perkins was appointed to the Factory Investigating Commission, convened in response to the Triangle fire, and the panel held hearings all over New York state before drafting 20 laws aimed at improving workplace safety. Some of the new laws required fire drills, set occupancy limits in buildings and required exit signs to be clearly posted. "Policies that were enacted because of that fire permeate American workplaces now," Downey said. Days after the Triangle fire, 100,000 mourners marched in a funeral procession through the streets of New York, while another 250,000 lined the route. Their grief built support for the right of garment workers to unionize. "It created a strong garment workers union," said Bruce Raynor, president of Workers United, the 21st-century heir to the International Ladies Garment Workers Union. "It helped to really start the modern labour movement." He said the Triangle fire commemoration resonates strongly today, given the labour struggles across the country and in Wisconsin, where a law passed this month limits public workers' collective bargaining rights. "One hundred years later, 150,000 people are protesting in Madison, Wis., over the same issue," he said: "the right of working people to organize." It was a warm spring Saturday when dozens of immigrant girls and women leapt to their deaths -- some with their clothes on fire, some holding hands -- as horrified onlookers watched the Triangle Shirtwaist factory burn. Events: Descendants of victims and survivors of the fire will gather Friday for a procession to the site in Manhattan's Greenwich Village. The building now houses New York University classrooms and labs. Suzanne Pred Bass, a Manhattan psychotherapist and theater producer, is the great-niece of Katie Weiner, who survived the Triangle fire, and of Rose Weiner, who did not. The fire started at end of the workday and raced from the eighth floor to the ninth and 10th. As hundreds of workers -- mainly Jewish and Italian immigrant women and girls, the youngest 14 -- tried to escape, they found a crucial door apparently locked. Firefighters rushed to the scene and raised their ladders, which reached only to the sixth floor. The fire was under control in 18 minutes -- too late. Trial: At the trial later that year of Triangle owners Max Blanck and Isaac Harris on manslaughter charges, survivors testified that their escape had been blocked by a locked door on the ninth floor. Some said the door was kept locked to prevent theft. Harris lives in Los Angeles but is spending March in New York to take part in Triangle commemorations. An artwork she created to honor the fire victims -- made of antique shirtwaists and handkerchiefs -- will be displayed at the New York City Fire Museum for a month. Changes: One witness to the Triangle workers' death plunges was Frances Perkins, who later became the first female Cabinet member when President Franklin Roosevelt appointed her secretary of labor. Perkins was having tea nearby and heard the commotion. She ran to the scene as the first body hit the ground. "It created a strong garment workers union," said Bruce Raynor, president of Workers United, the 21st-century heir to the International Ladies Garment Workers Union. "It helped to really start the modern labor movement." He said the Triangle fire commemoration resonates strongly today, given the labor struggles across the country and in Wisconsin, where a law passed this month limits public workers' collective bargaining rights. 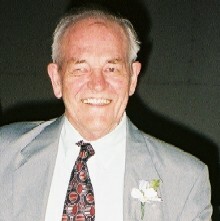 A Facebook friend, Ada May Brown said, "Mr. Frank Buckles age 110 passed on yesterday. He was the last surviving US soldier of WWI. An ambulance driver of that war, who would at 108 speak before Congress to insure his generations service was not ignored. What an amazing thing to live to see planes become a reality, cars instead of buggies and man on the moon." Not many of us will reach such a revered age, yet they tell us that our children have a better chance than we to do so. More power to them if they are able to represent the best of the generation and stand for some ideals the new generations can appreciate. Would that each of us could inspire at least one youngster to walk the right path successfully. Meanwhile here in West Texas and the southern part of New Mexico, the Weather Service reports 5,000 acres were burned by the Hockley County wildfire, which is now 100 percent contained. Three homes were lost in the blaze. At one point the entire city of Borger was being evacuated. These fires were fed by winds in excess of 70 mph gusts, taxing the fire fighters expertise and stamina. 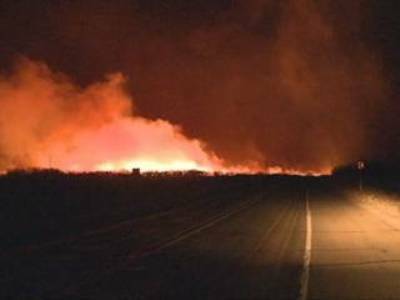 In the panhandle, wildfires burned thousands of acres and dozens of properties in the Amarillo area. Fires destroyed or damaged 30 homes and about 27 other structures in Mesilla Park. Another 20 homes burned in Potter County. The Amarillo Globe News reports more than 150 firefighters and 50 trucks were used to fight the flames in the area. The Southeast New Mexico blaze took out three buildings as more than 30,000 acres were reported scorched across Southeast New Mexico. The blaze started about 12 miles north of Maljamar jumping highways 206 and 457; as it moved east, between Lovington and Tatum, 29 fire units responded. In the Permian Basin, near Midland on I-20 (closer to home) an eight-car pileup in the thick smoke and dust is blamed for one death. Also, a firefighter is reported to have sustained second-degree burns battling a blaze in Colorado City. Out in this part of the two states that are desert areas with very low rainfall, there are not many natural fire breaks like mountains, gulches, lakes or rivers making it flat enough that the wind sweeps across everything rapidly. We hope for everyone's sake that this bad spell of windy weather is over soon. This issue we lack the talent of John I. Blair because not only is Clara in hospital, John is also having some medical tests and appointments himself. Adding to Prayerlists for both of them! Bruce Clifford's musical poems are "I Will Always Love You as Big As The Sky," "Living In A Dream," and "The Love I Have for You." Yours truly adds a couple more poems, "Laundry Day" and "What Is." Mattie Lennon includes an entry form for a special literary contest in Ireland, and explains all about "Slaggin'" in his column "Irish Eyes." Thomas F. O'Neill in his column "Introspective" tells a story of a Shenandoah miner. Gerard Meister ("Thinking Out Loud") humorously updates us with his on-going battle with technology. Eric Shackle sends us not only "Eric Shackle's Column" but two intriguing articles: "Global Search for Treasure Hunters" and "Leafy Sea Dragons Festival." "Angel Whispers" by Peg Jones, reminds us we have only to ask. "Consider This" in which LC Van Savage tells it like it is about commercials, while her article, "On Babushkas and Elitism" strikes a different note. Leo C. Helmer, brings both his column, "Cookin' With Leo" and an article "Labor Unions in the United States," explaining some things about unions and the organization benefits that many do not understand. The continuing story, "Rabbo Tales," adds Chapter 7 of this adult fantasy. 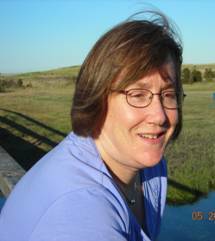 Click on Mary E. Adair for bio and list of other works published by Pencil Stubs Online. OK, so it has been a while since I have encountered my Dear Sweet Italian Fairy Godmother, and I suppose it was because I have not been spending much time on the back patio. Let’s face it it’s been one bad winter, even for Texas, colder than a well diggers lunch bucket. But now February has passed on and now it is March and in Texas March signals spring, even long before the 21st comes around. In a day or two we will be turning on the air conditioner to cool the place down. In any event I ventured out yesterday, spit on my finger and held it up to the breeze, and guess what my extremity did not freeze and drop off, so I figured it was safe to park my tail and enjoy the moment. Well, you might know, it wasn’t too long before I was enjoying the serenity with a cool one when who should show up but My Dear Sweet Italian Fairy Godmother. “We’ll see, but now here is another good Italian Recipe, a pie made with Italian Sausage." “Sounds good to me, let’s have it.” I sure do have to learn to watch my words when I speak to my Dear Sweet Italian Fairy Godmother; she always lets me have it. SLAM, BANG with the magic wand bit, but now I do have the recipe for Italian Sausage Pie as only Caesar’s Concubines could cook it. 2 cups Frozen Mixed Vegetables, thawed, drained. Heat the oven to 400°F. Lightly butter a 9 inch glass pie plate or spray it with cooking spray. In a 10 inch cast iron skillet cook the sausage over medium heat 8 to 10 minutes until thoroughly browned, drain. Spread sausage in pie pan. Sprinkle vegetables over top. In a mixing bowl combine the remaining ingredients, mixing well with a whisk or fork until well blended, pour over meat mixture. Bake for 30 to 35 minutes or until top is golden brown. Let stand 5 minutes before serving. A jug of good Italian Red Wine will top it off. Ya’ll Take Care Now, Ya’heah! Click on Leocthasme for bio and list of other works published by Pencil Stubs Online. When we first heard of a Leafy Sea Dragon Festival in Yankalilla, South Australia, we thought it must be a hoax. Yankalilla sounds more like the name of an American town. But, just as a newspaper named The Boomerang is published in the American state of Wyoming, there is a small town named Yankalilla in South Australia. 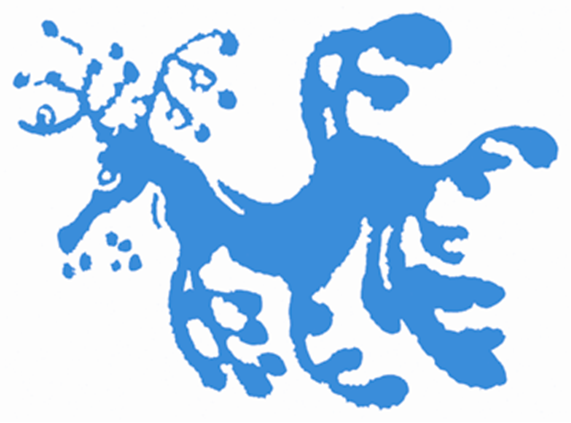 And leafy sea dragons abound in its coastal waters. 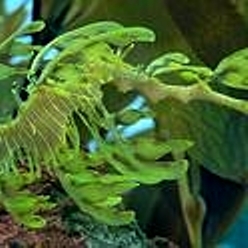 Leafy sea dragons are strange marine fish that look like seaweed. They have long projections from their bodies which act as camouflage. They are so named because they look like miniature versions of mythical dragons. They are not fierce like their dreaded namesakes; in fact, they have no teeth. Leafy sea dragons are slightly larger than their better known cousins, sea horses. When fully grown, they reach a length of 20 to 24cm. (8 to 10 inches). Male leaf sea dragons and male sea horses both nurture their partners' eggs until they hatch out. These strange fish are protected as an endangered species in Australia. The Chattanooga Aquarium in Tennessee is the only body that has successfully bred them in captivity. This year's festival will be held from April 15 to 24. Click on Eric Shackle for bio and list of other works published by Pencil Stubs Online. And give her a thank you, and a belated bow. As I am trying to decide to write tonight I have come to the conclusion that what I write about is not always mine. It feels like I am being led to write whatever the angels want me to write about. So I listen and wait for them to come close to me and write what I am hearing deep in my heart. The other day I was thinking about what to write and I didn’t get very much inspiration, but then I had face book open and everyone seemed to want to speak to me that night. So I said maybe another time would be better. Today I spoke to my angels and asked them what I should write about. And they said to write from heart because that is where the inspiration truly exists. I have written about the heart place many times and it always seems to be bit different. I am not sure why except to say that there always seems to be a different way of thinking about this heart place, which my angels seem to speak of so much. I asked them what they wanted to speak of and I hear, two words; trust and peace.. I am not sure why these two words were spoken to me. I feel that these concepts are important in that if we are to stay in the heart place, that trust and peace are both something we need to be able to grasp. The concepts we commonly hear are trust in God, trust in the universe, trust that it will be ok, and trust in each other. I guess I am speaking about trust in God or trust in the universe. Trusting that everything is ok. Trusting the universe is doing well and that our hopes and our dreams will come to fruition in due time. Trusting all will work in divine timing. How does this trust feel to you? Are you restless or are you at peace. Do you feel that peace that makes you feel all is good and that hopefulness for only all good to happen. Peace is an inner knowing that all is fine and the peace helps us to also feel a lot joy in our hearts. When I feel joy, it is because I feel peaceful, and because I trust in the universe. Love starts to be felt in the heart. It’s like a beacon of light working hard to shine brightly. At first it flickers then it’s able to shine very strong and everyone can feel this love that lives in your heart. The emotions of the heart are so different from the emotions of our ego. The emotions of the ego are jealousy, anger, hate, impatience, faithlessness, and so much more. Where is the heart in these words? There is none. But words like, love, trust, peace, serenity, happy, inspiration, clarity, calm, understanding, forgiveness, healing, release, abundance, hope, faith, create are all words that reside in the heart. They are words that are positive and they speak of only success. The words spoken from the ego are words that are extremely negative and they suppress words like joy, happiness, love, peace etc. When we think from the heart and feel from the heart we find we are in a good place and that the universe is with us every step of the way. There are a lot of ways in finding the heart place. One way that I find is really good is to make a daily grateful list, of 10 things for all that we are grateful for in our lives. Another way is to do a random act of kindness each day for someone you don’t know. And when you do this act of kindness encourage others to return an act of kindness to someone else. You start to have clarity of what is really important to you, on a deeper level. Sometimes the things that we think should matter aren’t really the reality of what we think is our reality. What are some of the other things we could do to invite us to live in the heart. How can we help others to know what it’s like to live in the heart place? Or can we actually help people to come back to their heart place. It is really up them as we all have freewill. When the cobwebs are cleared and the fog has left there, most likely we will find the heart place, going at a pace that is our own, not someone else’s pace. The heart place is closer than you think and when you get there you will know that is the place you can be who you truly are in all aspects of your life. The Angels await; only ask for assistance in this and they will be glad to help at any time. We are all on a journey in our lifetime and we all have different lessons to learn. It’s up to us to be aware of the lessons to learn. The lessons all have common threads and the main thread is letting love into your life and sharing your love to others. How we get there will be the journey and while we are on our journey, to enjoy our journey to the fullest, so that we can be best we can be throughout our lives. 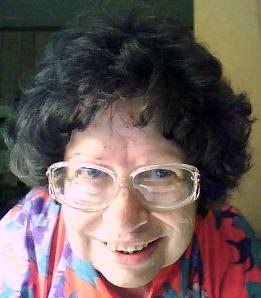 Click on Peg Jones for bio and list of other works published by Pencil Stubs Online. In every part of the world there are legends that get passed down from one generation to the other. This story from the Pennsylvania coal region is no exception. I feel it’s a story worth telling because it reflects the rich cultural heritage of the region. Alfonso and Angelina arrived in New York City in 1931 as third class passengers from Italy. Angelina was pregnant at the time with her first child. She prayed during the voyage that her child be born in America so that he or she could have a better life and future as an American. In New York City they were at the mercy of kind Italian families that took them in and taught them the ways of large city life. The simple things that we take for granted were difficult for them such as getting on a bus, riding a trolley, and purchasing food. Angelina would become confused with the American currency and at times was taken advantage of with purchases. Little educational skills and not knowing the English language made finding employment in New York City virtually impossible. Alfonso heard about the coal mines of Pennsylvania and so he and his wife and new born son traveled to Shenandoah where he obtained employment as a coal miner. He would rise in the morning six days a week before the sun would rise and enter the coal mine. In the evening after the sun set he would leave the mine. After a hard day’s work the miners would gather near the Maple Hill colliery and ride a trolley for a single penny to Shenandoah. Covered in coal dust, and wearing the mining equipment that was leased to him by the mining company. Alfonso would hop off the trolley on the second hundred block of Coal Street in Shenandoah. He could wash the coal dust down with a cold mug of ice cold beer at Giuseppe's Tavern. Some of the Italians played Italian music and sang Italian songs on an old piano in that character filled place. On occasions Alfonso sang and played along with an accordion to entertain the patrons. He would then walk a few blocks from Giuseppe's Tavern to his home which he also rented from the mining company for $10.00 a month. Angelina would not start cooking until he arrived home and washed up and it was always the same meal. Pasta with his favorite Pasta De Fagula soup. It was an economical meal for them because after the mining company made their deductions from his pay for the leasing of his equipment and his rent for his home. He was lucky if he cleared 50 cents a week. Eventually two more children came along and to make ends meet Angelina worked in a shirt factory, baked and sold bread. They also opened the attic of their home to a young Italian border named Francisco. He moved into their home in 1941 and he became a member of their family and eventually he became a miner as well. Alfonso and his family looked forward to Sundays where they attended Our Lady of Mount Carmel Church. The Miners and their families would also gather at the Glovers Hill Park which at that time was called the little Italy of Shenandoah. It was there on Sunday afternoons during the summer months that the Families shared food, played music, sang songs, played various games and told mining stories to their children and what their lives were like in the old country prior to immigrating to America. Mining is a dangerous occupation and the miners quickly learned that the mules in the mines were more valuable to the mining companies then the miners. The miners were just expendable labor for the mining companies. They dealt with cave-ins, gas explosions, mine flooding, and many miners died and suffered physical ailments from breathing in the coal dust. Alfonso was no exception and on a Saturday in 1947 there was a cave-in at the Maple Hill mine and four miners were trapped in the deep darkness of the mine shaft. It was damp, cold, and the miners were frightened and unable to see. They heard Alfonso's voice coming through the mine shaft in the cold darkness. He told them in Italian that everything is going to be okay and not to worry. He told the miners to un-strap their mining belts and to buckle all the belts together to make a long leather rope so that they have something to hold on to. It was to prevent them from becoming separated in the pitch blackness of the deep mine shaft. He told them to follow his voice and to hold on to the leather belts. His voice guided them down a long winding shaft. Francisco with frustration in his voice yelled, "Alfonso, how da hell do you know where you go, you get us more lost." Alfonso told him, "shut you face I know what I do." Eventually they came to a pile of large rocks and slabs of coal. Alfonso told them if they move the coal slabs they will be able to work their way out of the mine shaft and he told them to hurry. Francisco once again with anger and frustration in his voice yelled, "Alfonso how do you know this? you craze, how do you know this?" Moving the rocks, coal, and large pieces of slate in the pitch damp darkness of the mine shaft was no easy task. Alfonso told them once again if they want to get out of the mine alive they must hurry. A few hours of moving the stones and slabs of coal they felt an opening and Alfonso told them to stay together and continue going forward in the mine shaft. They soon began to see lights from lanterns and they heard the voices of other miners coming in the opposite direction of the mine shaft. Francisco yelled out "thank you Jesus, Mary, Joseph, and the holy Donkey, how da hell did you know what shaft we in?" "Alfonse told us" came the reply "he told us to hurry and get you guys out because the shaft is about ready to give way." "You craze Alfonso is here," yelled Francesco, "tell him Alfonso you here,” but there was no reply from Alfonso. As the miners exited the mine they could hear the loud rumbling of the mine caving-in behind them and the dust and suet rising from what was once the entrance to the mine. "Jesus" said one of the rescuers. "You gota that right" said Francisco "I start praying Rosary and start Novena as soon ah as I get home." "Where is Alfonso" asked one of the rescuers, "he was with me." "He was ah right next to me the whole time," said Francisco, "you craze." 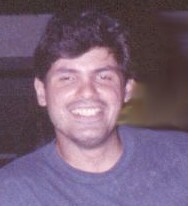 The mystery of Alfonso's disappearance remained a mystery for two weeks because that was when his body was found at the original cave-in site. Miners however swore they saw him getting on the trolley each morning to go to work and getting off the trolley to enter Giuseppe's Tavern at the end of a hard day’s work. Some Italians even swore they heard him singing along to his favorite songs in Giuseppe's Tavern. Angelina told Francisco and her children that she could hear Alfonso hanging up his mining equipment each evening except for Sundays. She said that she hears him hanging up his mining equipment as if he is getting ready to wash up for a hot meal. She also told her family years after Alfonso's death that she can still feel his presence in the house and him lying down next to her at night. From 1947 to the closing of the mines in 1954, there have been numerous sightings of Alfonso warning the miners about the presence of gas in the mines, mine flooding, and impending mine cave-ins. Alfonso has been a mining legend since his death in 1947, and the Italians who knew him told his story to their Children and they in turn told their Children the same stories. The miners and their families also implicitly understood which I believe is becoming lost in today's society that it takes a village to raise a child. They brought a part of their villages from their native countries to the Pennsylvania coal region. It was also their ethnic values in the mining communities that were instilled in the children within those communities. They in turn instilled those same values in their children and their neighbor's children. The Italians reflected that when they built little Italy and their church in Shenandoah. It wasn’t just the Italian miners though it was all the immigrants that settled into the Pennsylvania coal region that gave the region its rich character. They didn’t move to the coal region because coal mining is such a great job. On the contrary they made sacrifices and they labored so that their children and their children’s children can have better opportunities and better lives as Americans. Their ethnic values and their heritage have been proudly passed on and it is now our responsibility to keep their heritage alive. I believe the greatest gifts that we can give to children are stories that will help them gain a deeper understanding and an appreciation of our nation's history and ethnic diversity. They in turn will keep our history alive when they tell their children the same stories. The stories of how our ancestors immigrated to America, labored, and made sacrifices, so that their children, grandchildren, and their grandchildren's children can have a better educational opportunities and brighter future. There is no longer a little Italy in Shenandoah and the last of the old Italians have passed away and the mines have been closed for over 50 years. However, those who know the history of Shenandoah and the history of the miners in the Pennsylvania coal region can learn from the miners’ work ethic, their loyalties to their families, their communities, their churches, and their overall values. The famous British author and social reformer, Charles Dickens (1812-1870) wanted to be remembered by the books he had written, and not by statues. So he would not have been worried when vandals 40 years ago removed a marble statue showing him holding a quill and a scroll of paper, from an honored position in Sydney's Centennial Park. The statue was recently exhumed from the backyard of a house in the Blue Mountains, an hour's drive west from Sydney. It has now been restored to its original position in Centennial Park. The only other life-sized statue of Dickens (whose books are still popaular in many countries) is in the U.S. -- in Clark Park, West Philadelphia (aptly named the city of brotherly love). American sculptor Frank Elwell designed and cast a beautiful grouping of Dickens and Little Nell. In his home country, a monument to Dickens will be erected in Portsmouth to be featured in next year's celebrations to mark the 200th anniversary of the great author’s birth. 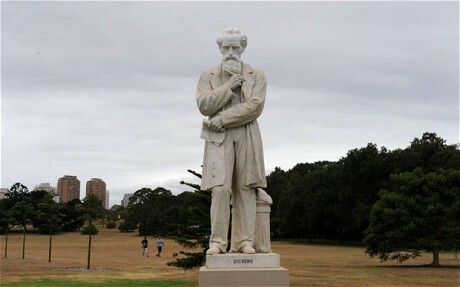 Rare Charles Dickens statue restored to Sydney park after 40 years missing. Related story: Off With Their Heads! My wife was very upset with me because I’m still having trouble getting the hang of how to use our new cell phones. Seems that I must be doing something wrong, because she can’t hear me when she calls me and sometimes when I call her. Click on Gerard Meister for bio and list of other works published by Pencil Stubs Online.
" A sense of humour keen enough to show a man his own absurdities, as well as those of other people, will keep him from the commission of all sins, or nearly all, save those worth committing." -Samual Lover. I’m getting a bit of a slagging lately (I won’t go into details) and it’s great fun. I’m not talking about offensive remarks or insults. I’m referring to good substantial, wholesome, slagging. SLAGGING : The delicate art of teasing someone in such a fashion that they look forward to it. It is practiced widely throughout Ireland by all manner of people. Well not all manner; there are those, a small minority, who, through low self-esteem, feelings of inadequacy or some form of psychological abnormality cannot take a slagging. And they have a right to live too despite the fact that they could truthfully echo the words of the character in God of Carnage who said “I don’t have a sense of humour and I have no intention of acquiring one.” Will the humourless, however, admit to their condition? Almost eighty years ago Frank Moore Colby asked, “Men will confess to treason, murder, arson, false teeth or a wig. How many of them will own up to a lack of humour.”? There are people in these islands who have convinced juries that a graceful taunt was an insult. And they are living comfortably on the proceeds. Entrants may submit only one short story for the competition. Stories must be the original work of the author. Stories must not have been previously published or accepted for future publication elsewhere. All entries must be accompanied by an entry form. The name of the entrant must not appear on the story itself. The winning prize will be 1000 Euro and presentation by one of our guests of the Canon Sheehan Perpetual Literary Award to be held by the winner for a period of one year. A smaller award will be presented on a permanent basis. The winning story will be read by one of our esteemed guests on the first night of the festival in a ceremony to take place in Doneraile Court. Entrants may submit only one poem for the competition. Poems must be the original work of the author. Poems must not have been previously published or accepted for future publication elsewhere. All entries must be accompanied by an entry form. The name of the entrant must not appear on the poem itself. The winning prize will be 500 Euro and presentation by one of our guests of the Edward Spencer Perpetual Poetry Award for a period of one year. A smaller award will be presented on a permanent basis. The winning poem will be read by one of our esteemed guests on the first night of the festival in a ceremony to take place in Doneraile Court. Click on Mattie Lennon for bio and list of other works published by Pencil Stubs Online.